The Yaris Cabrio Concept was a 2-door convertible presented at the March 2000 Geneva Motor Show. The Yaris Cabrio featured a fabric roof. It never reached the production stage. The Toyota ES3 (Eco Spirit cubed) was a concept car made by Toyota in 2001. It was designed to use parts made from bioplastics. The ES3 was not made into a production vehicle but the technology was used in the Raum in 2003 under the name of Toyota Eco-Plastic. The Toyota Pod was a concept car created by Toyota in collaboration with Sony. The Pod was first shown at the October 2001 Tokyo Motor Show. The Pod was unique as it was designed with artificial intelligence systems built in to make the car appear more personal. The Pod was much like a living being due to the artificial intelligence programmed into it. It featured a screen inside with Sony-created software running on it, capable of creating shopping lists and running music and radio. The car could also judge the attitude and mood of the driver based on their reactions and how they are driving, and could offer advice on how to improve their current mood. The seats inside are like stools which could freely spin and rotate. On the exterior, the Pod could express its own feelings with coloured LEDs - red for anger, yellow for happy, blue for sad - and an antenna that wags, much like a dog's tail. The Pod was designed as a "car of the future" and hence was never put into production. The Pod was featured in the game Gran Turismo Concept and had an exclusive race to itself. A new track - using segments from the Clubman Stage Route 5 course - was created which involved 6 Pods driving through the pitlane backwards before stopping in a special area for several seconds before being allowed to resume racing. The Toyota DMT (Dual Mode Traveller) was a concept van made by Toyota and first shown at the October 2001 Tokyo Motor Show. The van had a high mounted driving position and a rear cabin designed to be useful as an office or studio. The Toyota FXS (Future eXperimental Sports) was a concept car made by Toyota and first shown at the October 2001 Tokyo Motor Show, and later at the March 2002 Geneva Motor Show. Based on the Soarer, the coupe was powered by a 4.3 L 3UZ-FE V8 engine using a 6-speed sequential manual gearbox. The Toyota RSC ("Rugged Sport Coupe") was a Toyota 2-door SUV concept car that was first shown at the February 2001 Chicago Auto Show. The RSC was designed by Calty as a 'pure concept vehicle', with no intention to go into production but to 'connect emotionally with young buyers'. Design cues came from rally cars used in the World Rally Championships, with functional lines, a lack of luxury features and 'designed to convey the sparse, functional simplicity of a race car'. The RSC was based on the RAV4. The RSC was never made into a production vehicle. The FCHV-3 (Fuel Cell Hybrid Vehicle 3) was the third vehicle built by Toyota in its Fuel Cell Vehicle program. In March 2001, it was presented at the International Symposium on Fuel-Cell Vehicles in Tokyo. Like the FCHV-1 and FCHV-2, it was based on the Highlander. The FCHV-4 (Fuel Cell Hybrid Vehicle 4) was the fourth vehicle built by Toyota in its Fuel Cell Vehicle program. Through leasing programs in the USA and Japan, it was the first to be commercialised. Like the FCHV-1, FCHV-2 and FCHV-3, it was based on the Highlander. The Toyota MR2 Street Affair was a Toyota concept sports car based on the MR2 that was designed by Toyota Germany. A turbocharger was added to the engine to lift power from 100 kW to 193 kW. The body was made from fibreglass, with carbon fibre panels and numerous air scoops leading to the engine bay. The front took style cues from Toyota's Formula 1 car, having a pointed nose and a front wing close to the ground with Formula 1 style wing-lets in front of semi-exposed tyres. The rear mirror was replaced with a camera. The Toyota CS&S is a four-wheel drive, mid-engine sports car concept made by Toyota and displayed in 2003. It utilizes a hybrid system combining electric motors to drive the front wheels, and a combination of a petrol engine and electric motors powering the rear. It is the first Toyota vehicle to have the feature Toyota Space Touch, a system in which the driver "touches" holographic projections to control other systems (e.g. air conditioning) inside the car. The Toyota PM is a single seat concept vehicle built by Toyota around the idea of personal mobility. Multiple vehicles can communicate with each other to encourage "meeting, linking and hanging out together". It was shown at the October 2003 Tokyo Motor Show. Not to be confused with Toyota Tacoma X-Runner. The Toyota X Runner is a four-wheel drive coupé utility concept vehicle designed and built by Toyota Australia in 2003. The X-Runner was based on the Avalon, using the Avalon's front cabin, front sheet metal (except the grill) and mechanicals. The Avalon's chassis (the Toyota modular platform, also shared with the Camry) was stretched by 150 mm just before the rear wheels. The 1MZ-FE engine was upgraded with a TRD supercharger and transmission is by a version of the viscous coupled four-wheel-drive system used in the Lexus RX300. The front suspension kept the MacPherson struts from the Avalon with upgraded brakes and 19" wheels. The rear suspension was modified from the Tarago 4WD. The Rugged Youth Utility was a 4WD concept vehicle that was first shown at the January 2004 North American International Auto Show. It had styling cues reminiscent of the FJ40 Landcruiser but based on the modern Land Cruiser Prado platform. It was not meant to be a production vehicle but demand was high enough that it was put into production in early 2006 as the FJ Cruiser. The Fine-N was a concept vehicle that was an update to the Fine-S and was shown at the October 2003 Tokyo Motor Show and the January 2004 North American International Auto Show. The Alessandro Volta is a concept car developed in the collaboration of the Japanese manufacturer Toyota and the Italian design company Italdesign Giugiaro. The concept vehicle named after Alessandro Volta, the Italian physicist who invented the battery (and the namesake of the volt unit of measurement), was officially unveiled at the 2004 Geneva Motor Show as a study of a hybrid electric sports car. The concept never materialised as a production car due to high costs involved. The car had butterfly doors and was built on a carbon fibre chassis and it featured 3 seats with the driver seated in the middle and the passengers on the sides behind the driver. It features a four-wheel-drive hybrid electric power-train of the Lexus RX 400h which combines a 3.3 L V6 3MZ-FE petrol engine with two electric motors, one on each axle. The combination develops a maximum output of 300 kW (402 bhp), which enables the car to accelerate from 0 to 100 km/h (0 to 62 mph) in 4.03 seconds and reach the top speed of 250 km/h (155 mph). It uses drive-by-wire controls. The MTRC is a response to the cultural interests of young people today, such as mobile phones, video games, computers and internet play. Power is provided by Toyota's hydrogen fuel cells. These provide electricity to four wheel hub motors. Each wheel also features electronically controlled suspension and sensors, allowing each wheel to maximise grip and to use the correct amount of torque for the current road conditions. The open cockpit requires the driver to wear a helmet - which has an internal head-up display. The MTRC is available in the videogame Gran Turismo 4. As it is a concept car, it cannot be purchased but it can be won by placing first place in the "4wd Challenge". MTRC at the 2004 Geneva Motor Show. The FTX is a concept full-size pickup truck that Toyota showed to the public at the January 2004 North American International Auto Show. The redesigned 2007 model year Tundra was based on the FTX concept vehicle. The Fine-X uses a fuel cell hybrid system which drives four independent motors - one in each wheel. It can make perfect U-turns and park very easily, thanks to its independent four-wheel steering. The Fine-X uses the latest IT/ITS peripheral-monitoring technology that allows the Fine-X to have much smoother driving. The Fine-X uses gull-wing doors, which are said to make it easier to get in and out of the car, however cannot be opened in a rollover accident. The powered seats can rotate and shift sideways through the gull-wing door openings. The FSC (Flexible Saloon Concept) was a concept wagon based on the Camry that was first shown at the October 2005 Tokyo Motor Show. The first two rows had two bucket seats each. The third row bench seat could be set to hold two more passengers. The rear seat backrest could also be folded down to make a long deck at lower cushion height. Lastly, the rear seat backrest could be left upright and the lower cushions could be electrically retracted into the cargo area to make a deep cargo space. The FSC was made into production in Japan only as the Mark X ZiO. The Camry TS-01 is a concept car based on the Camry and was unveiled at the March 2005 Melbourne International Motor Show in Australia. The aim of the Camry TS-01 was to showcase the skill of Toyota Australia designers and engineers. Its major features are the stylistic changes and the supercharged 1MZ-FE engine. The Aurion Sports Concept was a concept car based on the Aurion (which was itself based on the Camry) and revealed at the October 2006 Australian International Motor Show. The car was a styling exercise previewing the TRD Aurion, which was subsequently released in August 2007. The Toyota F3R was a concept car by Toyota's Calty design facility that was introduced at the January 2006 North American International Auto Show. It is a hybrid powered minivan designed to have youthful appeal and escape the "soccer mom" stigma commonly associated with minivans. The F3R has three rows of seats with three doors on either side. The front and middle doors open normally but the rear door opens in the opposite direction. There is no pillar between the middle and rear doors, so the openings are very large. The right and centre seats in middle row fold flat into the floor and the remaining left hand seat can be fully reclined to make a sideways-facing bench seat. Exterior styling is similar to the Scion xB with 22 inch wheels. The Toyota Hybrid X is a hybrid concept built by Toyota's ED² studio in France and first shown at the March 2007 Geneva Motor Show. Toyota claims the design of this concept car points to the future direction of the Toyota Prius. The design of the Toyota Hybrid X is a 5-door hatchback with a fastback-like styling. According to interior designer Laurent Bouzige, the Hybrid X is supposed to be a very sensory experience, and the ambiance is linked to the passengers' sight, sound, touch, and smell senses. Interior surfaces have a variety of light effects, textures and even fragrance from a perfume diffuser. The drive-by-wire steering pad has a touch screen and there is another screen in the centre of the dashboard to show vehicle information and to set minor controls. The rear seats can each be turned 12 degrees left or right to help passengers look inwards or outwards. The Toyota Hi-CT (Hi ride City Truck) is a 2-seat concept car built by Toyota and first shown at the October 2007 Tokyo Motor Show. Motive power is by a plug-in hybrid with batteries under the floor. A 100-volt AC socket is provided to power accessories. The rear seats can be rotated to look backwards through the rear hatch. The boot is a removable module which can be replaced with other modules. If no module is used then the small cargo deck can be used to carry items such as surfboards. The rear hatch can not be opened when the rear deck is in use or if a module is in place. The Toyota RiN is a concept car built by Toyota and first shown at the October 2007 Tokyo Motor Show. The vehicle was designed to promote relaxation and healthiness. It has received much media attention for its odd design and its steering wheel, which changes colour depending on the driver's mood. The concept was unveiled at the October 2007 Tokyo Motor Show. The concept features four seats accessed by two large sliding doors, and windows made of green glass, designed to reduce ultraviolet and infra-red light. "The concept, which looks like some sort of futuristic stagecoach, is designed to help its driver become one with nature". The car features a pinpoint humidifier, and an oxygen-level conditioner. It was reported that the car was inspired by a milkfloat. A Toyota press release stated that "the RiN focuses on increased comfort and serene, healthy living. Through their relationship to the vehicle, drivers are encouraged to reevaluate themselves and, furthermore, to turn their attention to society and nature, producing a healthy rhythm for both mind and body." Toyota says the car "creates a feeling of harmony with the surrounding environment by using sliding doors with a low window that lets you view nature at ground level, as well as headlights with light distribution control that take into consideration pedestrians and vehicles coming in the opposite direction." The Toyota FT-HS is a hybrid sports car concept introduced at the January 2007 North American International Auto Show. Calty Design Research designed the concept and suggests that it could fill the place of the Toyota Supra. FT-HS stands for Future Toyota Hybrid Sport. The A-BAT is a concept truck revealed on 27 December 2007 and manufactured by Toyota. The A-BAT is the first Toyota to have a mid-gate allowing cargo longer than the standard four-foot bed to extend into the cab (like a Chevrolet Avalanche or Honda Ridgeline). Power for the A-BAT comes from Toyota's Hybrid Synergy Drive mated to a four-cylinder engine. The A-BAT officially debuted at the January 2008 North American International Auto Show in Detroit. The concept truck is similar in size to Toyota's compact SUV, the RAV4. The A-BAT measures 181.3 inches in length,  while the RAV4 measures 181.1 inches. It can also seat up to four people. On 22 September 2008, the website PickupTrucks.com indicated that Toyota had confirmed that some form of the Toyota A-BAT would see production, barring unforeseen production costs. The article also stated that Toyota had cancelled production of a Tundra diesel truck. Although Toyota later denied official confirmation of the Tundra's cancellation, no mention was made denying the statement regarding the A-BAT. Sources say that a production version of the concept will likely have a four-cylinder engine as an option, as well as a four-cylinder hybrid engine. The FCHV-adv (Fuel Cell Hybrid Vehicle advanced) was the fifth vehicle built by Toyota in its Fuel Cell Vehicle program. It was available through a leasing program in Japan from 11 September 2008. Like the FCHV-1, FCHV-2, FCHV-3 and FCHV-4, it was based on the Highlander. The Toyota Winglet is a concept self-balancing two-wheeled personal transporter similar in form and function to the Segway PT and the Honda U3-X. It is capable of cruising at 6 km/h (4 mph). Unveiled on 1 August 2008, it was not offered for consumer sale. Toyota tested the devices in the third quarter of 2009 at a Japanese airport and a seaside resort. The Aygo Crazy is a concept vehicle built by Toyota as a modified Toyota Aygo and first revealed at the July 2008 British International Motor Show. The Toyota FT-EV is a small, battery electric, concept vehicle built by Toyota as a modified Toyota iQ and demonstrated at the January 2009 North American International Auto Show. Two of the iQ's seats were removed to make room for the battery packs. Toyota plans to start selling the FT-EV in 2012. According to Toyota the FT-EV was designed as an urban commuter car with a range of 50 miles (80 km) per charge. The Toyota FT-EV II is a small, battery electric, concept car built by Toyota as a modified Toyota iQ and first shown at the October 2009 Tokyo Motor Show. It differs from the FT-EV by seating four people, by having more parts of the body transparent and electrically operated sliding doors. A pair of linked joysticks (each joystick duplicating the other) control acceleration, braking and steering using drive-by-wire. The top speed is over 100 km/h (62 mph) and the range is 90 km (56 mi). 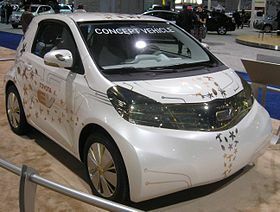 The Scion iQ Concept vehicle was built by Five Axis (California, USA) based on the Toyota iQ and displayed in April 2009 at the New York Auto Show. Changes included a 1.3-litre 4-cylinder VVT-i engine, Five Axis custom stainless exhaust, 18x8.5-inch Five:AD S6:F custom wheels with nickel finish prototyped by MetalFX, Yokohama S.drive 2.5/40R18 tires, TEIN Super Street coil over suspension, Five Axis wide body conversion kit, custom accented headlights and tail lights. An identical car, rebadged as the Toyota iQ Sport, was later presented at the September 2009 Frankfurt Motor Show. Motor Trend reported the production version of Scion iQ would begin in North America in late 2010 for the 2011 model year, or in early 2011 for the 2012 model year. The air bags will be recalibrated for unbelted and out-of-position occupants and the bumpers will be slightly extended. The Toyota Auris HSD Full Hybrid Concept vehicle was a petrol-electric hybrid vehicle based on the Auris and displayed at the September 2009 Frankfurt Motor Show. The Toyota FT-86 is a concept car manufactured jointly by Toyota and Subaru. The vehicle consists of many design cues from the earlier FT-HS concept. It features a 2.0-litre Toyota-Subaru "D-4S" boxer engine. The FT-86 rides on a modified Subaru Impreza platform with 101.2-inch wheelbase, with length, width, and height measuring 163.8, 69.3, and 49.6 inches, respectively. It is expected that the Toyota and Subaru versions will be styled similarly on the outside, with the Subaru version getting different head and tail lights and a different hood. It has a 2.0-litre naturally aspirated boxer engine mated to a Subaru 6-speed manual transmission. The concept is fitted with brakes from Advics, a joint venture company formed between Aisin Seiki, Denso, Sumitomo Electric and Toyota. According to chief engineer Tetsuya Tada, the unique shoujyouhi red colour was based on the colour of a Japanese monkey's backside. The FT-86 was first shown at the October 2009 Tokyo Motor Show and the first showing outside Japan was at the March 2010 Geneva Motor Show. An enhanced version called the FT-86 G Sports was shown at the January 2010 Tokyo Auto Salon as part of the Toyota G Sports range. Toyota Europe presented a revised FT-86 II at the March 2011 Geneva Motor Show as the successor to the FT-86. At the October 2009 Tokyo Motor Show, Jim Lentz, COO and President of Toyota Motor Sales USA confirmed that the production version of the FT-86 was scheduled to be sold in America but an actual date was not yet disclosed. At the March 2010 Geneva Motor Show, Toyota Europe announced that the production version of the vehicle will be released in November 2011. On 2 September 2010, British car magazine AutoExpress  reported the Subaru model will feature an all-wheel-drive drivetrain as opposed to the salient feature of rear-wheel drive for the Toyota-badged model. They claimed the Subaru model's all-wheel-drive system would have a rear-wheel bias, improving handling. The flat-four, longitudinal engine layout would also be fully coherent with the model policy and mechanical characteristics of all Subaru cars of the past 30 years. More recent reporting indicates the Subaru version will not have the advantage of turbocharging to give it the power necessary for sporting performance. It may not have all-wheel drive. The Prius Plug-In Concept is a plug-in hybrid concept car shown at the October 2009 Tokyo Motor Show based on the third generation Prius and the predecessor of the for-mass-production Toyota Prius Plug-in Hybrid. Its batteries can be charged in 180 minutes from 100 volts or in 100 minutes from 200 volts and can travel 20 km before needing to start the petrol engine. ^ "Toyota Yaris Cabrio Concept" (PDF) (Press release). UK: Toyota. 2000-03-01. Retrieved 2013-12-26. ^ "Toyota Yaris Cabrio Concept picture # 01 of 03". netcarshow.com. Retrieved 2013-03-26. ^ "Market Debut as Toyota Eco-Plastic" (PDF). Environmental & Social Report 2003. Toyota. 2003. Retrieved 2010-04-21. ^ "2001 Toyota ES3 Concept". supercars.net. 2001. Retrieved 2010-04-21. ^ Liz Kim (2006-10-11). "Toyota ES3". Inside Line. Edmunds. Retrieved 2010-04-21. ^ Masatsugu Arimoto (2001-10-20). "Toyota's expressive POD concept for Tokyo Motor Show". cardesignnews. Retrieved 2010-04-20. ^ "2002 Toyota POD Images, Information and History". conceptcarz. 2002. Retrieved 2010-04-20. ^ a b John Rettie (2001-01-28). "2001 Tokyo Show, Part II". The Car Connection. Retrieved 2010-07-19. ^ a b c d Dredge, Richard (2004). Concept Cars: Designing for the Future. San Diego: Thunder Bay Press. pp. 70–71. ISBN 1-59223-324-4. ^ a b c "Panasonic Toyota F1 Spearheads Motor Sport Challenge" (PDF) (Press release). UK: Toyota. 2011-09-12. Retrieved 2013-09-28. ^ "Toyota FSX Concept". otoblack. 2010-05-16. Retrieved 2010-07-19. ^ a b c "Toyota Rugged Sport Coupe". ToyotaOffRoad.com. 2001-02-07. Retrieved 2010-04-22. ^ a b "First Look: Toyota RSC". Motor Trend (May). 2001. ^ a b "Toyota unveils RSC "Rugged Sport Coupe Concept" Chicago". Automotive Intelligence. 2001-02-07. Retrieved 2010-04-22. ^ "Toyota Exhibit: Sydney Motor Show 2002". Web Wombat. 2002. Retrieved 2010-08-05. ^ "Toyota to Unveil Two Show Stoppers at Brisbane Motor Show". AutoWeb. 2003-01-20. Retrieved 2010-08-05. ^ "PM — the personal mobility vehicle". Toyota USA. Retrieved 2010-06-30. ^ Kevin Bonsor. "How the Toyota PM Works". how stuff works. Retrieved 2010-11-28. ^ "Tokyo Motor Show 2003 - Highlights". cardeisgnnew. Archived from the original on 2013-01-02. Retrieved 2010-11-28. ^ "Toyota Concept Vehicles -- NLSV". Toyota USA. Retrieved 2011-07-13. ^ Michelle Krebs. "Toyota NLSV". cars.com. Retrieved 2011-07-13. ^ Bruce Newton (2003-03-03). "First look: X-Runner is a first for Toyota". GoAuto.com.au. Retrieved 2010-11-05. ^ Marton Pettendy (2003-03-26). "Exclusive! Why Toyota built X-Runner". GoAuto.com.au. Retrieved 2010-11-05. ^ "2011 FJ Cruiser Press Kit". Toyota Australia. 2011-03-07. Retrieved 2011-09-16. ^ a b "Concept Car Gallery". Toyota. Retrieved 2011-03-10. ^ Simona (November 2005). "2003 Toyota Fine S". TopSpeed. Retrieved 2011-03-10. ^ "Toyota Concept Vehicles -- FINE-S". Toyota USA. Retrieved 2011-03-10. ^ "Toyota Hybrid Synergy Drive Hybrid future". Toyota Australia. Retrieved 2011-03-10. ^ "Press release for North America International Auto Show". Toyota Japan. March 2003. Retrieved 2011-03-10. ^ "Toyota Fine-N Concept 2003". Auto Concept reviews. October 2003. Retrieved 2011-03-09. ^ "Toyota Concept Vehicles -- FINE-N". Toyota USA. Retrieved 2011-03-09. ^ Toyota press release (January 2004). "2004 Detroit Auto Show: Toyota Exhibits FINE-N Concept". The Auto Channel. Retrieved 2011-03-09. ^ "2004 Toyota Alessandro Volta Concept". RSportsCars.com. Retrieved 2009-05-28. ^ "2004 Toyota Alessandro Volta". Serious Wheels. Retrieved 2009-05-28. ^ "Toyota Motor Triathlon Race Car". Toyota Europe. Retrieved 2011-04-13. ^ a b Ron Kiino (April 2004). "Toyota Motor Triathlon Race Car - Auto Shows". Car and Driver. Retrieved 2011-04-13. ^ a b c Shane Speck. "How the Toyota MTRC Works". How Stuff Works. Discovery. Retrieved 2011-04-13. ^ "Toyota FTX concept may be future Tundra pickup". Canadian Driver FTX. 2004-01-05. Retrieved 2010-08-16. ^ a b "Toyota Fine-T fuel cell hybrid concept 2006". Auto Concept reviews. March 2006. Retrieved 2011-03-10. ^ "Toyota to Display Fuel Cell Hybrid and Personal Mobility Concept Vehicles at Tokyo Motor Show". Toyota. October 2005. Retrieved 2011-03-09. ^ "Tokyo Motor Show 2005 - Highlights". Car Design News. October 2005. Archived from the original on 2012-08-11. Retrieved 2011-03-09. ^ "Toyota FSC - Auto Shows - 2005 Tokyo Motor Show". Car and Driver. October 2005. Archived from the original on 2011-06-09. Retrieved 2010-08-05. ^ "Toyota FSC Concept". World Car Fans. 2005-10-25. Retrieved 2010-08-05. ^ Ganz, Andrew (2007-06-29). "Toyota FSC Rumored For Production". Left Lane. Retrieved 2010-08-05. ^ Nunn, Peter (2007-09-26). "Japan Report: Toyota Debuts Mark X ZiO". NextAutos. Retrieved 2010-08-05. ^ Roth, Dan (2007-09-27). "Japan: Toyota reveals Mark X ZiO". autoblog. Retrieved 2010-08-05. ^ Torr, Fean (2006-10-27). "2006 Australian International Motor Show: Part I". WebWombat. Retrieved 2007-10-12. ^ Joe DeMatio (April 2009). "AUTO SHOWS: 2007 Toyota F3R Concept". Automobile. Archived from the original on 2008-12-02. Retrieved 2010-06-21. ^ "F3R — style, performance and three rows of comfort". Toyota USA. 2006. Retrieved 2010-06-21. ^ "2008 AIMS PRESS KIT". Toyota Australia. October 2008. Retrieved 2011-07-13. ^ "Toyota Hybrid X concept". Left Lane News. 2007-03-06. Retrieved 2010-06-30. ^ Sam Abuelsamid (March 2007). "Geneva Motor Show: Toyota Hybrid-X concept". autobloggreen.com. Retrieved 2011-07-13. ^ Simona (October 2007). "2008 Toyota Hi-CT - Top Speed". Top Speed. Retrieved 2011-03-17. ^ Noel McKeegan (October 2007). "Toyota Hi-CT Concept lifestyle vehicle". gizmag. Retrieved 2011-03-17. ^ "Toyota Hi-CT Concept - Auto Shows - Car and Driver". October 2007. Retrieved 2011-03-17. ^ "Toyota news - Tokyo Madness: Toyota RiN and Hi-CT - 2007 - BBC Top Gear". Topgear.com. 2007-10-10. Retrieved 2010-06-29. ^ Lavrinc, Damon (2007-10-10). "Tokyo 2007 Preview: Toyota RiN wants you to relax, be healthy — Autoblog". Autoblog.com. Retrieved 2010-06-29. ^ "Toyota RiN Concept promotes driver well-being". Gizmag.com. 2007-10-22. Retrieved 2010-06-29. ^ a b "Toyota RiN Concept - Auto Shows". Car and Driver. Retrieved 2010-06-29. ^ "Toyota". Toyota. 1990-01-06. Retrieved 2010-06-29. ^ "Tokyo Auto Show Preview: Toyota 1/X". Edmunds.com. 2007-10-10. Archived from the original on 2009-02-23. Retrieved 2009-05-28. ^ "Tokyo 2007 Preview: Toyota 1/X (pronounced "1/Xth")". Autoblog. Weblogs, Inc. Retrieved 2009-05-28. ^ "Toyota Envisions Future Hybrid Made of Seaweed". motorcities.com. Retrieved 2009-05-28. ^ Toyota FT-HS World Premiere Archived 2009-07-06 at the Wayback Machine ROADandTRACK.com'.' Retrieved January 3, 2007. ^ Abuelsamid, Sam (2007-12-27). "Toyota A-BAT hybrid pickup concept". Autoblog. Weblogs, Inc. Retrieved 2007-12-28. ^ Wert, Ray (2007-12-27). "Toyota Reveals New Honda Ridgeline, Calls it the A-BAT Concept Hybrid Truck". Jalopnik. Gawker Media. Retrieved 2007-12-28. ^ "Toyota A-BAT Concept revealed after dark". Autoblog. Weblogs, Inc. 2008-01-13. Retrieved 2009-05-26. ^ "2008 Toyota RAV4 Styles". Edmunds.com. Retrieved 2009-05-26. ^ "A-BAT A Go, Tundra Light-Duty Diesel Shelved". PickupTrucks.com. 2008-09-22. Retrieved 2009-05-28. ^ a b "Fuel Cell Hybrid Vehicle-Advanced". US: Toyota. 2010-02-26. Archived from the original on 2012-05-30. Retrieved 2012-04-03. ^ "Toyota to Begin Leasing Advanced Fuel Cell Hybrid Vehicle". Toyota. 2008-08-29. Archived from the original on 2013-04-25. Retrieved 2009-10-08. ^ "Toyota develops personal transport assistance robot 'Winglet'" (Press release). Toyota. 2008-07-31. Retrieved 2018-06-16. ^ Katz, Leslie (2008-08-01). "Segway, meet the Toyota Winglet". CNET. US. Retrieved 2018-06-16. ^ Ricker, Thomas (2008-08-01). "Toyota's Winglet aims to usurp Segway, why we don't know". engadget. US. Retrieved 2018-06-16. ^ Ohnsman, Alan (2009-01-10). "Toyota to Sell Tiny U.S. 'Urban Commuter' Battery Car by 2012". Bloomberg.com. Retrieved 2009-06-30. ^ Hardigree, Matt (2009-01-10). "Toyota FT-EV Concept: An Electric Car For The Tiny Masses - Toyota FT-EV". Jalopnik. Retrieved 2009-06-29. ^ Eric Loveday (2011-04-27). "s the Toyota FT-EV's 50-mile range too low?". AutoblogGreen. Retrieved 2011-05-07. ^ a b "TMC to Display 3 Concepts, F1 Car at Tokyo Motor Show". 2009-10-06. Retrieved 2009-10-13. ^ Williams, Martyn (2009-10-21). "Goodbye steering wheel, here comes drive-by-joystick". Network World. Retrieved 2009-10-22. ^ Abuelsamid, Sam (2009-04-08). "New York 2009: The Scion iQ goes Big Wheels!". Autoblog.com. Retrieved 2011-01-26. ^ Korzeniewski, Jeremy (2009-06-29). "REPORT: Scion iQ headed for America by early 2011 with a few changes". Autoblog.com. Retrieved 2011-01-26. ^ Paul Tan (2009-10-13). "Toyota FT-86 to feature D-4S Boxer Engine". Retrieved 2009-10-13. ^ "Toyota FT-86 Concept and FT-86 G Sports concept technical facts". Tune86 (in Japanese). Retrieved 2010-07-16. ^ "TOYOTA exhibits new concepts at the Tokyo Motor Show" (in Japanese). Toyota. 2009-10-06. Retrieved 2010-07-16. ^ Hans Greimel (2009-10-21). "Tokyo auto show: Toyota goes sporty with FT-86". Retrieved 2010-01-20. ^ Brian Alexander (2009-10-06). "Toyota FT-86 Concept to debut at Tokyo Auto Show". Money & Company. The Los Angeles Times. Retrieved 2009-10-06. ^ "FT86 concept at Geneva auto show 2010!". Tune86 (in Japanese). Retrieved 2010-07-16. ^ Noah Joseph (2010-02-09). "Video: Toyota's Jim Lentz confirms FT-86 (not Supra) coming to America". autoblog.com. Retrieved 2010-07-16. ^ "Report: Contrary to rumors, Toyota FT-86 development on track, expected Nov. 2011". Tune86. Retrieved 2010-07-26. ^ "Report: Subaru WRX Coupé spied". Archived from the original on 2010-09-04. ^ "Subaru BRZ concept: Boxer rebellion". The New Zealand Herald. 2011-09-22. Retrieved 2011-11-23. ^ "Toyota ESQ Communications". Priusphv.com. Retrieved 2011-01-26. This page was last edited on 27 February 2019, at 13:53 (UTC).